Another quiet day on the betting front coming up. Most of my day is going to be taken up looking at houses with the good lady anyway, so I won't see any racing until tonight. 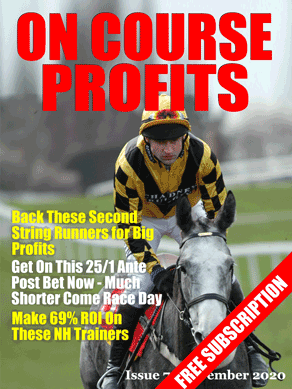 https://www.sportinglife.com/racing/racecards/2018-09-06/carlisle/racecard/490263/betfair-amateur-riders-handicap if you want to have a look. For today, a couple of races at Sandown last week from which a couple have gone into trackers. Most of these just got an okay from me, many of them were badly in need of a run but two of them caught the eye for various reasons. On looks, the one I liked best was Simon Crisford’s Eden Gardens, who doesn’t have the most stunning of pedigrees but has plenty of scope to do better, very well put together and looks a bit of class. Held up towards the rear for most of the contest, he’s got a bit outpaced before staying on at one pace in the closing stages. Not beaten that far, he will learn plenty from this and is one worth following. Michael Attwater is not a name you associate with winning 2yos, but Daniel Dravot, despite finishing one from last here, might be capable of winning a race or two this autumn. Green as grass in the paddock and shouting his head off (so loudly he set a few others off too) he misbehaved himself to post and I expected more of the same in the race. But he was there until the furlong pole, which is a lot longer than I thought he’d survive, before getting tired and fading. He’s worth keeping an eye on as there’s a bit of ability there, and if he learns from this, there could be a nursery to be won down the line. The second division of this threw up a couple to watch as well. Nicest horse in the paddock for me was Richard Hannon’s Dawn Treader, a very strong, solidly built individual that continually caught the eye as he walked round (nice walker too). I had a bit ew (as did the trainer on the rails, I hear) and like all good ew bets he finished fourth. He was staying on well in the final furlong and I’d suggest the money is only lent. Back in sixth David Lanigan’s Millions Memories was the other I liked pre-race. Rather more leggy than Dawn Treader but nevertheless has something about him and he was a bit green in the preliminaries as well. I thought of all of them he’d improve them most next time up so it was pleasing to see him doing some good late work. Again, one that might be worth a quid or two next time, with plenty of improvement likely. At Carlisle today the one I like best is Khelman in the 7.00. My comments for him day it all – he looked like a horse on the way back last time out and he's so well handicapped these days that I feel he must go close. 9-1 that's around this morning looks more than fair and I'll be having a bet. If time allows, given I've done the card, I may put up a couple of syndicates for Carlisle on Colossus later.